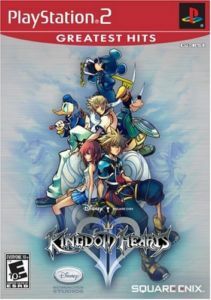 KINGDOM HEARTS II follows Sora, Donald, and Goofy on their continuing quest. Sora is looking for his lost friend Riku, while Donald and Goofy are searching for their missing king. The story begins in Twilight Town, a quiet burg nestled between night and day. Sora and friends are joined by a vibrant new cast of characters, including the king himself! Together, they will encounter countless dangers in worlds both familiar and brand-new.